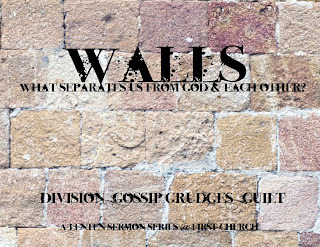 This week as the launch of our Lenten sermon series "Walls: What Separates Us From God and Each Other?" I will be preaching on Division. But first, let's take a look at Lent and what it means. Lent is a season within the church that has it's roots in repentance, though it has come to take on different meanings, depending on the tradition within which it is celebrated. It quite literally refers to "40 days," or more specifically the forty days between Ash Wednesday and Easter. For centuries Christians have viewed the Lenten season as a time for reflection, discipline and self-control. Lent has become synonymous with "giving up" something, or denying oneself pleasure as an act of solidarity with the suffering of Christ. More recently, Christians have begun "taking up" something like the disciplines of fasting, prayer or Bible study as a means of expressing their devotion. It's my belief, however, that we need to return to our roots when it comes to Lent. In other words, we need to practice some repentance. Repentance seems to have fallen out of favor lately in the Christian world. Most of us equate the idea of repentance with high pressure altar calls, street preacher's, televangelists and fundamentalist Christians. If repentance is coerced... it's not really repentance. We need more repentance. "Repent!" was the first word out of Jesus' mouth when he began his ministry, after all. We would do well to practice it more often. We have much to repent. And it should come from somewhere deep inside of us, out of brokenness and frailty. There are few of us, though, that want to be vulnerable enough to reveal our brokenness. We prefer to hide it from the world. There are things that separate us from God and from each other. And these things are the bricks that we use to build walls to hide our brokenness, to keep some distance between us and anyone who might find us out. For the next few weeks we are going to focus on four of these things. There are others, to be sure, but these four are the main culprits for most of the ills within the Church and in Christian communities. 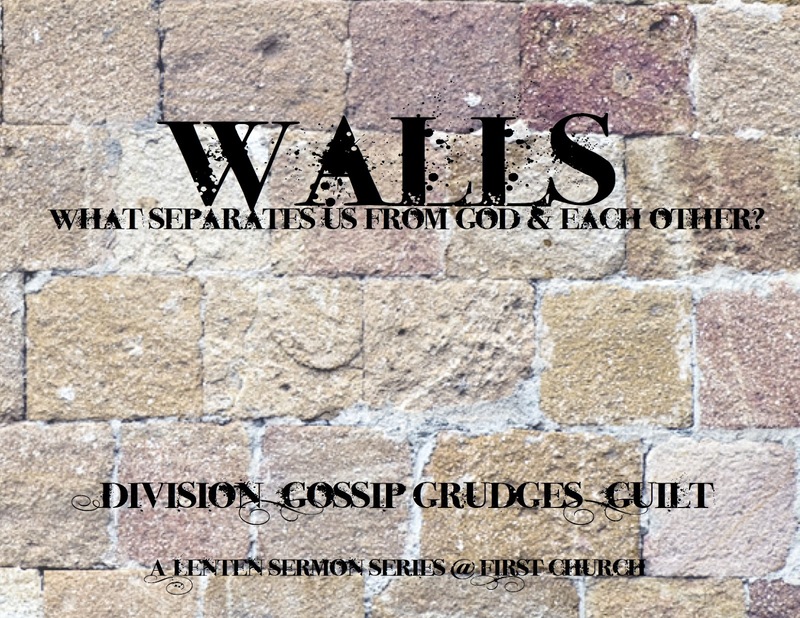 We'll be talking about Division, Gossip, Grudges and Guilt. There is an old hymn that we sing from time to time in worship: "They Will Know We Are Christians." The chorus has this line, "...they will know we are Christians by our love, by our love, and they will know we are Christians by our love." I wish that were true, but unfortunately I think that most people will know we are Christians "by our strife." The lack of unity among the members of the Body of Christ is a cause for despair for some Christians and lifts up Jesus to contempt by the world. In other words, our lack of unity has become the very thing that drives believers within the Church out of it, and keeps nonbelievers without the Church from wanting to be in it. And we fight over the most ridiculous things. Churches have been torn apart by disagreements over worship style, carpet color, building programs, which hymnal to use... We fight over modes of baptism, and communion. We argue about which version of the Bible is more accurate. Then there are the disagreements over theology, Biblical interpretation, who's in and who's out, what is sin and what isn't... It can get very intense and very personal very quickly. Sadly, what divides us, defines us. As you can imagine, this is not what Jesus intended. Jesus' prayer for his disciples was a prayer for unity. Of all the things he could have prayed for, he prayed a prayer that his followers would be "one." Alexander the Great had a vision for world unity achieved through military conquest and the dissemination of Greek culture. The Romans had the same notion, and even took Alexander's ideas of unity a step further, and expanded their "unified" empire to the farthest reaches of the known ancient world. In Jesus' day the Essenes, a separatist Jewish group who lived in the caves near Qumran believed that unity could be achieved by isolation. But the kind of unity that Jesus was talking about was a unity that was centered around his Lordship---his own claim that the only way to God was through him. The prayer is not just a prayer for his disciples then---it was a prayer for his disciples that would be. The word hina (that) early in his prayer indicates a purpose that transcends the moment. It means the prayer holds the same meaning for us as for his disciples. Additionally, in verse 22 Jesus uses the word dedoka for "now given" which indicates an eternal perspective. In other words, we aren't off the hook here. This passage is explicitly meant for all Jesus followers in every time and every place. In verse 23 Jesus indicates that there should be a change in the hearts of his disciples from "believing" which he uses in the beginning of the prayer, to "knowing." What Jesus is saying by this shift of wording is that unity centered around his Lordship is more than just a good idea, an ideal, something that we talk glowingly about, but do nothing to achieve. It must be part of our identity. Christian unity begins and ends with a unity of personal relationship. And by personal relationship, I mean a personal relationship with Jesus Christ by those who claim to be his followers. I mean a declaration that Jesus is Lord, that he is the Way, the Truth and the Life. I mean that Jesus, in some miraculous, surprising, and unexpected way is the only means for salvation and a life spent in eternal joy with God. And further, I mean personal relationships with those who are our brothers and sisters in Christ. So what does the Bible say about those of us who don't get this, who continue to revel in disunity and who do nothing to know Jesus and to show Jesus to one another. Paul discusses those who he would consider "Dividers" and their characteristics. They are people who cause divisions and create stumbling blocks. They are greedy and self-serving. Paul says that they "serve their bellies." They are people who make it harder for someone else to be a Christian. They are a chrestologia a person who speaks well, but acts ill; someone who pretends to serve Jesus, but in reality is destroying the faith. When you go through this litany of characteristics, you see a description of a person who denies the central tenet of Christianity that Jesus pointed to as the focus of Christian unity: his Lordship. I read the story this week of a pastor who met with a prospective church member after worship one Sunday. The man told the pastor that he had come from a neighboring church---one that had just experienced a devastating church split. The man bragged about being at the center of it all. "Do you know this church?" the man asked the pastor. The pastor said that he did. "I wrecked it." the man said proudly. This is the kind of person that Paul described. I have a pastor friend who went through a horrible first year in ministry, right out of seminary. It seems that two women in his new church were so opposed to his being selected as a pastor without their consent that they launched a campaign of lies, intimidation and division in order to get him fired. Thank God, they were caught scheming about lies they were going to tell to the governing body of the church before things got too out of hand. Even so, these same women managed to cause a great deal of damage, and did their best after they left the church to tear it apart. These are the kind of people Paul described. People that deny the central focus of Christian unity. They deny that Jesus is Lord. They may give lip service to this notion, but they deny it with their desire for strife and disunity. Here's the thing... The church should be a glimpse of an eternal reality that existed before Creation and will exist again when Jesus returns. But too many churches are preoccupied with trivial matters--things that have no eternal importance. We love our organizations, our creeds, rituals and traditions more than we love Jesus and one another. We proclaim that "Jesus is Lord!" but then deny it with our divisions. We look just like the world that we are supposed to be witnessing to about a new reality. We stop talking about it like it is a good idea and we actually do something about it. We repent. We ask forgiveness from God and from one another. We ask for clean hands and pure hearts. Several years ago I preached on an Ash Wednesday service at the church I was serving at the time. Our church had been experiencing some strife, and there were warring factions in the congregation. We thought that in a show of unity we would combine all of our worship services into one. Our choir sang an anthem. Our praise band from the Contemporary service led in a praise song. Our youth band from our evening service led a song as well. We adjusted our liturgy and format to reflect the diversity of our congregation. It didn't work. I looked out at the congregation and was met with scowls and angry faces. The scripture reading that day was from Joel chapter 2. In the passage that was read right before I preached, there is a line that reads "let the priests weep before the temple and the altar." This passage describes a public act of repentance by the entire congregation. When I heard the part about the priests weeping, I began to cry uncontrollably. I couldn't stop it. I stood at the pulpit, choked up and unable to speak. I had no idea why God had touched my heart so deeply, but I cried like a baby in front of the congregation. The Scripture came to life that day for our church. We should have repented as one. But instead we received angry emails and phone calls the next day. Several members declared that if we ever tried to do anything like that again, they would leave the church. Unity was an idea to them. Not a knowledge. When we actually repent of the ways that we contribute to division in the Church, when we focus on the fact that Jesus is Lord---lord of all Creation, our lives, the source of life and salvation---we soon discover that all the ways we were divided fade and seem trivial. And then we can simply be the Church. Then we can know Jesus and show Jesus. Pastor, I came across your post in searching for things that divide the church. I teach a college and young singles bible study class and am planning a lesson series on this topic. After reading your blog, I have to put myself at the top of the list. It caused me to look back and remember times I said something to someone about our local church that was divisive and not unifying. Thank you for your post and allowing God to speak through you to me.